With all the different types, styles, shapes and sizes of jewelry out there, it can be hard to keep all of your favorite accessories from turning into one big tangled mess. Investing in a jewelry organizer is a great solution to keep your vast array of necklaces and dangly earrings in order, but most organizers tend to be expensive and often aren’t exactly what you are looking for, whether in terms of aesthetic and design, or size and compartments. Luckily, there are tons of great ideas for DIY jewelry organizers on Pinterest that use easy-to-find items (you might even already have them in your home!) that won’t break the bank and that you can tailor to your exact taste and specifications. Check out our top picks for DIY jewelry organizers from Pinterest below and get crafting! A really cute and simple way to organize all of your bracelets with minimal materials is by gluing glass bottles you may have lying around the house (think novelty Mexican Coke and cream soda bottles) to the inside of a wooden box. You can choose to place it on a shelf or attach a thick twine or ribbon at the top to hang on your bedroom wall. Using a container that is already separated into various compartments is a great foundation for a DIY jewelry organizer. All you need for this project is a wooden utensil holder that you would typically find in anyone’s kitchen drawer and a set of small solid brass screw eyes. Twist the screws into the base of the holder to best suit your jewelry collection and spray paint the entire finished product for a pop of color to match your space, or leave the wood exposed for an earthy look. Use two screws and tightly bound wire at the back as if you were hanging a picture frame. Hang on your wall and voila! Instant organization. Almost every store has a discount or clearance housewares section, which is a great place to scope out a couple of cute patterned plates and a candlestick to assemble a two tiered jewelry organizer for any rings, watches or earrings you wear often and don’t mind keeping out in the open. Simply adhere the candlestick between the two plates (Gorilla Glue is a great way to make things stay put) and you have yourself an expensive looking tiered organizer that perfectly matches your aesthetic. Get creative and use an entire dish set (a plate, a bowl, and a mug) or thrifted glassware to create your DIY organizer. If your taste for design is a little bit more quirky and eccentric, you might be interested in using little plastic animals as a part of your jewelry organization endeavors. All you need for this project is a wooden plank and plastic animals that you can find at any toy store, or even at your local dollar store. Cut the plastic animals down the middle with a knife or a handsaw so they can be used as knobs and adhere to the wooden plank. Paint with spray paint and hang! You may also use decorative knobs and handles in instead of plastic animals if you choose. A towel rack isn’t just useful in the shower – use it in your bedroom to organize and display long dangly necklaces that are prone to getting tangled! Hang on your bedroom or bathroom wall and use matching shower hooks to hang your assortment of necklaces or to hang bracelets directly on to the towel rack to add organization and décor to your space. You can also use an adjustable curtain rod instead of a towel rack and add decorative curtain knobs to make your jewelry organizer even more unique. If your jewelry collection is too overwhelming to be stored out in the open or if you find yourself low on space, creating a hanging organizer from a wooden hanger is a great way to store your necklaces in your closet and away from view. Simply screw solid brass screw eyes along the bottom of the wooden hanger and hang in your closet or on your bedroom wall as a functional, yet decorative display. You can also capitalize on the shelf space in your room by screwing the brass screw eyes underneath things like floating shelves to create multipurpose display shelves. A great way to upcycle old wine bottles is to use them to organize your jewelry! Great for larger, heavier accessories, like watches or chunky bracelets, this DIY is pretty one-and-done – simply wash out bottles to get rid of any remaining liquid or residue and place bracelets around the bottle neck. Spray paint the exterior to better match your space and put a couple of flowers in the bottle to double as a vase! Jewelry boxes are a dime a dozen, but are rarely built to house and display a lot of earrings and rings, so those accessories often end up tossed together in a bowl where trying to find a matching pair of earrings becomes a feat. You can buy a basic wooden box from most craft stores or get creative and find another container you would like to use to stash your tiny accessories. 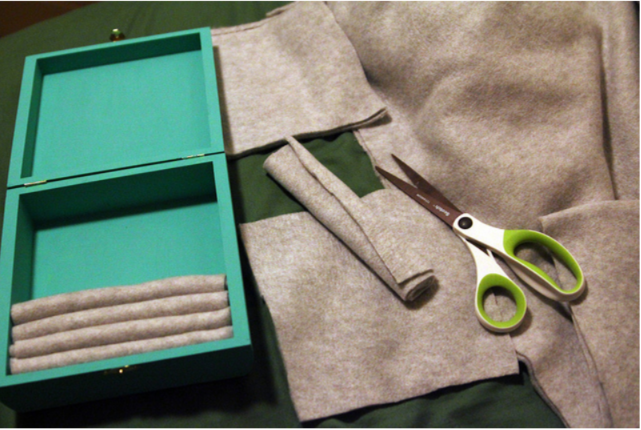 Cut about half a yard of fleece into squares and roll them up to create the cushioned inside of the jewelry box. Tuck the fleece rolls tightly next to one another, cover with fabric of your choice and place earrings and rings in place! If you are not the most craft-inclined but are still looking for a quick fix for jewelry organization, ice cube trays are already compartmentalized and make a great place to store your small jewelry and accessories. Simply place in a drawer for easy access. 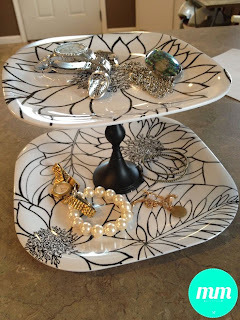 Since most ice cube trays are made from a hard plastic and are not very aesthetically pleasing, try spray painting your new jewelry holder to give it some life. Perhaps one of the more tried-and-true jewelry organizer DIYs, a corkboard is a great way to display your jewelry and also have free reign when it comes to rearranging your collection of jewelry as it changes. Choose the dimensions of corkboard that best suit your needs and your space and affix to wall using pushpins to hang necklaces, earrings and bracelets. If you are feeling like taking on more of a project, reinforce your jewelry display by affixing the corkboard to a foam mounting board and then framing it with a picture frame of your choice to add some character. You may also choose to attach a thick ribbon to the corkboard to better hang dangly earrings. 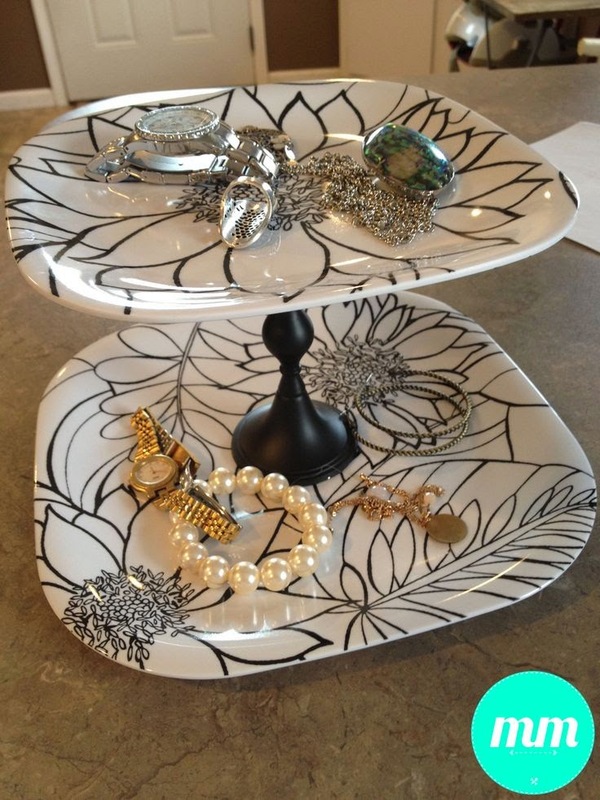 What DIY jewelry organizer is your favorite? Share with us in the comments! Visit us at www.lovieartjewelry.com for affordable wedding rings and jewelry for men and women!